Black and White Handbag Cake. We love creating handbag cakes and one of our recent hand bag cake creations reminded us how much fun and how great these designer cakes look. This Black and White Striped handbag cake was created from our delicious chocolate sponge cake recipe and filled with multi layers of chocolate butter cream. 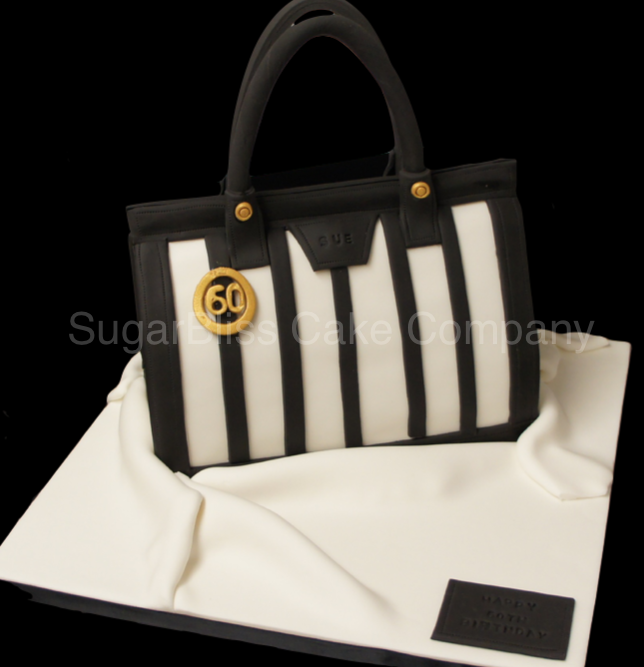 Our Black and White handbag cake is life size and supported using plastic cake dowels. The handbag cake was covered using white sugarpaste icing. Tylo powder was added to black sugarpaste icing and rolled to 3mm thickness and cut into 18mm stripes. The black stripes were added to the cake and using a stainless steel icing ruler to ensure each stripe was perfectly straight. Then using a stitching modelling tool detail was added to the edges of the handbag cake. A letter press tool was used to create the effect of embossed writing. Finally, the handbag handles were created using florist wire with black florist paste icing and rolled in to the correct shape. All the products used to create our black and white handbag cake are available from our cake decorating shop, Solihull, West midlands or why not simply order from our online cake decorating shop.